The bright and bouncy creations of Belgian artist and entrepreneur Bué The Warrior have lit up streets and smartphones alike all across the globe for years. We lost him to the sunny sidewalks of Mexico City and a batch of waffle irons last year, but that doesn’t mean he’s going to stop working with those he considers to be the best. That’s where the incredible -headed by founding partner, Case Studyo co-owner and KNOTORYUS favourite Mathieu Van Damme- Toykyo dream weavers come in. For ten years now, they have been the design studio behind some great campaigns, fashion shows, art editions, album covers and many other lauded achievements. A new collaboration between Bué The Warrior and the studio called ‘HOLLY x TOYKYO’ has just dropped, inspired by Mexican culture, Belgian colours and Bué's budding waffle empire called Holly Waffles. We caught up with Toykyo partner and art director Pointdextr, long-time friend and close collaborator to Bué, to delve into this collection’s origins, how they first met and what’s good for 2017.POINTDEXTR: Being long-time friends, we trust each other completely. Bué had no problem giving us total creative freedom to interpret the concept of Holly Waffles in our own way. Originally the plan was to develop just one t-shirt graphic, but we had so much fun designing, we ended up doing a small capsule collection. The collection radiates our signature style but we'd like to think we created something unique and specific for Holly Waffles. KNOTORYUS: We feel a "Lucha Libre" vibe coming from some of the designs. Tell us about your inspiration. POINTDEXTR: The collection is heavily inspired by Mexico, not only Lucha Libre masks but also Aztec and Maya imagery. Since Bué decided to get tatted up in Mexico, we wanted to give the collection a tattoo-flash feel. Of course the collection should be a mix of both cultures so we felt the need to incorporate something Belgian -besides the waffles. We decided the colour palette should boast the Belgian tricolore. This decision presented a challenge in itself as we admittedly never really liked our country’s flag and its unappealing colour combination. But we proved ourselves wrong as we feel the colours work perfectly with the images and even add to the flavour. KNOTORYUS: Tell us how and when you and Bué met and what you bond over the most. POINTDEXTR: We met each other through graffiti. The scene in Belgium, and Ghent in particular, is pretty small so you’re bound to meet other writers. Bué was somebody who I really looked up to at the time, and still do to this day. Getting to know him as a humble and cheerful person was refreshing and inspiring. Bué played a pivotal role in my development as an artist and designer. He also introduced me to Mathieu – so it’s safe to say without him Toykyo, as it is today, wouldn’t exist. What bonds us is mutual respect, a positive and open mind and a ‘forever young’ attitude. I don’t mean that in a juvenile way but I’m talking about the humbling realisation that at any point in your life there is still a whole world to discover and an infinite number of new things to learn. KNOTORYUS: For some people it might seem a bit strange that the great Bué The Warrior, at the peak of his career here in Belgium getting lots of press and being invited to paint everywhere, just up and left to open -of all things- a waffle place in -of all places- Mexico City. Tell us how you got this news and why this did or did not surprise you. 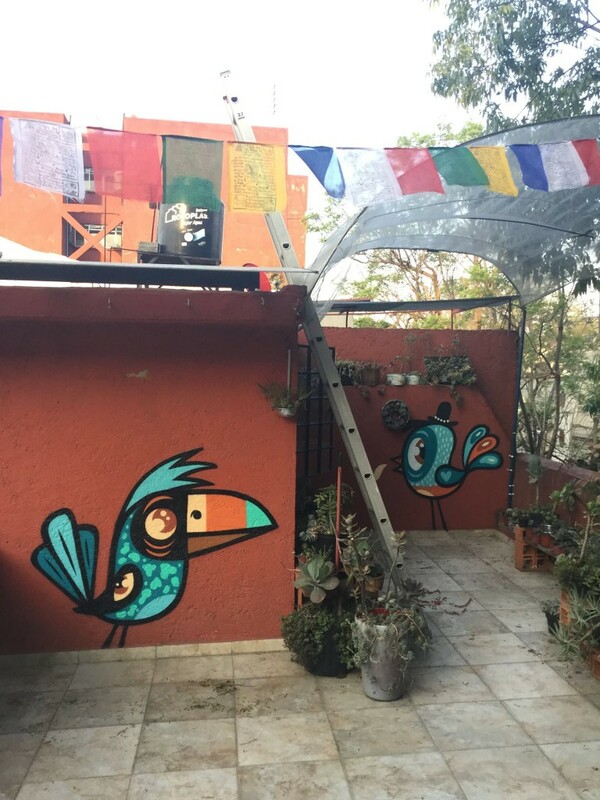 More than any other country he has visited on his extensive travels painting murals around the globe, Bué fell in love with the warm and vibrant culture of Mexico. But he felt this amazing country was missing something -other than more Bué murals- and he took it upon himself to introduce them to the best waffles in the world. KNOTORYUS: Did Bué name his waffle place after his godchild Holly, daughter of Toykyo's Mathieu? Has she seen the designs? What does she think? POINTDEXTR: Yes he did, he wanted it to be an homage to his godchild and of course it has a nice ring to it. Holly herself has seen the designs and she loves them, especially the animation and its soundtrack by Team Panini. Because now not only does she have her own waffle place, but it seems she also has her own cartoon and theme song. KNOTORYUS: Have you been to visit Bué? POINTDEXTR: Sadly we have been so busy with the new Toykyo we haven’t had the chance yet to cross the Atlantic to visit him. A trip to Mexico is one of Toykyo’s New Year’s resolutions. Having said that, it seems we see each other more than when he was in Belgium be it through Skype or Messenger. Not a week goes by without a chat.KNOTORYUS: Toykyo celebrated its 10th anniversary in 2016. Congratulations! Looking back, how did your style develop? POINTDEXTR: Wow, has it been 10 years already? Time really does fly when you’re having fun. Honestly we still feel we are a young up-and-coming design studio. Toykyo started out in 2006 but changed a lot throughout the years to what it is today. What started out as a platform to promote local talent transformed into an artist collective and finally evolved into a proper design studio. Along the way we may have developed a signature style, but we pride ourselves on being versatile. If there is one common thread that can be found in all our projects, it is an element of playfulness. We like to play all day and invite clients to join the fun. KNOTORYUS: Please tell us your biggest ambitions for 2017. POINTDEXTR: We aspire to do more of the same in 2017 but bigger and of course better. One of our goals is a collaboration with an international brand that grants us the same creative freedom as Holly Waffles did. In 2016 we played around with animating our graphics and hope to dive in even deeper in 2017, applying moving images in both personal as client-based work. We feel the studio is growing and hope to diversify even more in the upcoming year (maybe even by expanding our team). Our overall aim remains the same: evolve, transform, transcend.KNOTORYUS: What's the next big Toykyo collaboration you are working on? POINTDEXTR: One thing we are excited about is a very playful restaurant identity we are working on for one of our favourite top chefs. Everything is still on the hush-hush but we are looking forward to the rollout of the identity early 2017. It will be big and bright! KNOTORYUS: When talking to your friend in Mexico, how do you think running his own business has impacted him the most? POINTDEXTR: Bué has always been his own boss and he already knew what it takes to run a business. Having said that, running a waffle house / concept store as a Belgian in Mexico city is a whole 'nother ball game. We definitely noticed the startup of Holly Waffles was heavy; not only setting up the business but also missing his friends. The waffle place took up all of his time (he worked 7 days a week) and there was very little room for anything else let alone to go out and paint. We are happy to see he’s settled in now and the creative hiatus is over. Bué murals brighten up our Instagram feed once again. KNOTORYUS: What would be your own signature Holly Waffle and tell us its name + ingredients and toppings . POINTDEXTR: I once ate one of Bué’s waffles, when he was still test cooking, covered in some leftover super spicy pasta sauce and it is a food high I am still craving to this day. So our signature waffle would definitely have to be spicy. We would try and mix chillies, cilantro and coconut straight into the batter – top the waffle off with some Hot Tokito hot sauce and lemon zest - maybe even drizzle some lemon-infused honey on top – and serve it with a fresh papaya salad. In the tradition of choosing a name after our kids, it would have to be either ‘Dexter’ or ‘Oscar’. We’ll let Bué decide. KNOTORYUS: Which Mexican artists should we be on the lookout for? POINTDEXTR: Mexico has a very rich creative scene, seeing what happens over there pushes us to work even harder. One artist that continues to blow our minds is Smithe. He recently started his own creative agency, Copete Cohete, introducing us to his team of creative geniuses. A Toykyo x Copete Cohete collaboration would be fireworks. Let’s make that one happen in 2017! 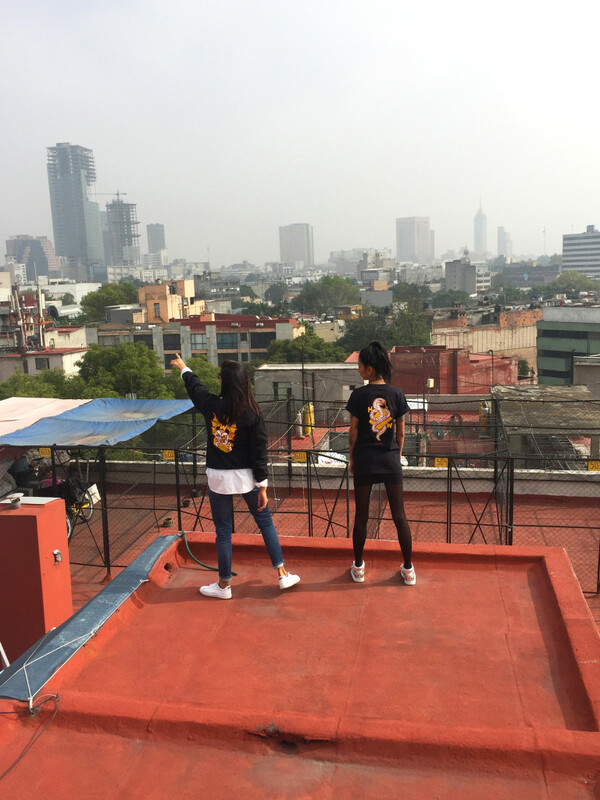 KNOTORYUS: Can people outside of Mexico get a hold of the HOLLY x TOYKYO collection?